While it was thought earlier this month that Texas wildfires this year would cause insured losses of around $250 million, it is now estimated that losses could be twice that amount. Mark Hanna, public relations manager for the Insurance Council of Texas says losses from the Bastrop fire alone are thought to be around $250 million, making it the costliest fire in Texas history. He says the fire has resulted in about 1,500 claims. He says accurate estimates were hard to make earlier because many areas were still inaccessible. As the fires begin to be contained, insurance adjusters have been able to take stock of the damage. Hanna notes that just about all affected policyholders have been contacted, and payments have begun to be made. The second-costliest fire in Texas history, the Possum Kingdom fire, also occurred this year, and it is expected to generate between $160 million and $175 million in insured losses. Hanna notes there were two Possum Kingdom fires—one in late spring and the other over Labor Day weekend. For the first of the two fires, Hanna says high-dollar homes were affected, making average losses per claim of around $750,000. “For the year right now, I would bet that we’re pushing a half-billion dollars,” Hanna says. He adds, “This has been a record year.” He blames the combination of no rain and record-high temperatures the state has seen in June, July and August. Strong winds have not helped either. In a bulletin, the Texas Forest Service says it responded to eight new fires yesterday, including a new large fire in Brewster County. That fire has burned 3,000 acres and is 0 percent contained as it is in an inaccessible area. 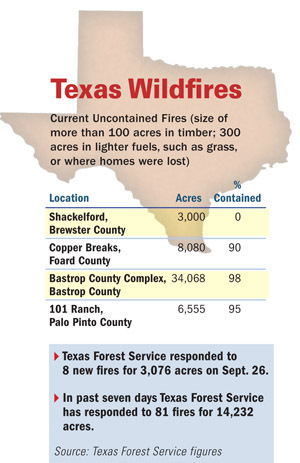 Over the past seven days, the Texas Forest Service says it has responded to 81 fires for 14,232 acres. The service has even issued a warning about welding and grinding, stating that those conducting welding activities should keep the area clear of vegetation, have a spotter watch for sparks, keep water and a fire extinguisher nearby, wet down the work area and avoid welding and grinding activities during red flag conditions or on windy days.